This collection consists of two sets of briefing books on China’s trade status’ elevation to Permanent Normal Trade Relations. 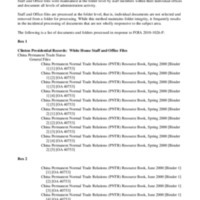 The briefing books “Spring 2000” were prepared in advance of the House vote on China’s PNTR on May 24 while the “June 2000” books updated/expanded the information to persuade the Senate’s favorable consideration of the question, which occurred on September 19. China’s PNTR status was signed into law by President Clinton in October 2000. Records include articles, bound material, briefing papers, fact sheets, legislation, letters, press material, reports, speech transcripts, statements, and testimonials. Topics covered in the binders include economics, US/regional national security, human rights, labor and environment, the World Trade Organization, industry and agriculture, and small business issues.